Dubai: An Etihad passenger plane bound for Jakarta out of Abu Dhabi has turned around shortly after take-off after it was discovered that one of its engines had a problem. Flight EY 474 departed the UAE capital’s international airport at 3:19 am Wednesday. However, just a few minutes into the air, when the A332 was at an altitude of 2,000 feet, it had to turn back, according to Flightaware’s track log. One of the passengers reported on social media that he heard an explosion just after the plane left the airport.“I heard an explosion from [the] right engine, and [the] aircraft [was] unstable for [a] few seconds." The UAE-based carrier confirmed that the flight was indeed diverted due to a “technical issue” with one engine. It assured that the plane managed to land safely and that all the passengers have disembarked. In a statement sent to Gulf News, the airline said a replacement aircraft was provided and that it departed Abu Dhabi at 7:30am. “Etihad Airways’ flight EY474, from Abu Dhabi to Jakarta, returned to Abu Dhabi Airport shortly after take-off due to a technical issue with one of its engines. The aircraft landed safely and passengers disembarked. A replacement aircraft was provided and the flight departed at 7.30am (Abu Dhabi local time)," said the airline. A passenger had posted on Twitter asking the airline about the incident. He said he heard an explosion from the right engine of the aircraft shortly after take-off. 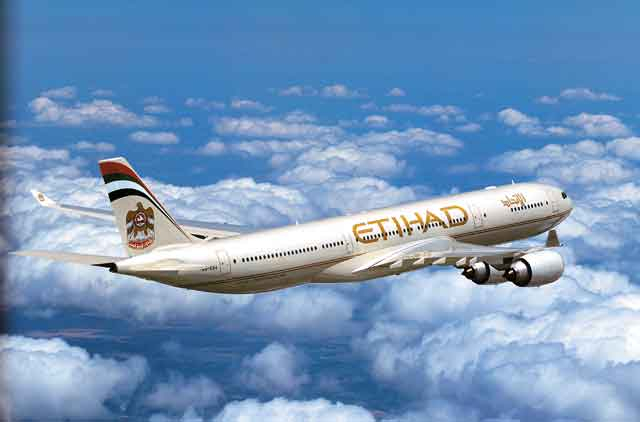 “Pilot managed to land the aircraft safely back to Abu Dhabi airport,” the customer said.